President Obama has found himself in the cellar for the first time since taking office: He fell to 39% in Gallup Poll tracking over the past weekend. Obama may or may not have a month or months when his average is below 40%. Still, it is a number that has already imprinted itself on the mind of the political community. Every White House dreads the day it falls below 40%. A psychological barrier is breached, opponents become emboldened, Congress becomes even more recalcitrant, and political vultures smell death. But if there’s any comfort for Obama, it is that every president since Lyndon Johnson has become familiar with the “dirty thirties” at some point in his tenure. Bad economies, failing wars and big scandals have humbled all modern chief executives, sooner or later. Let’s look at history. 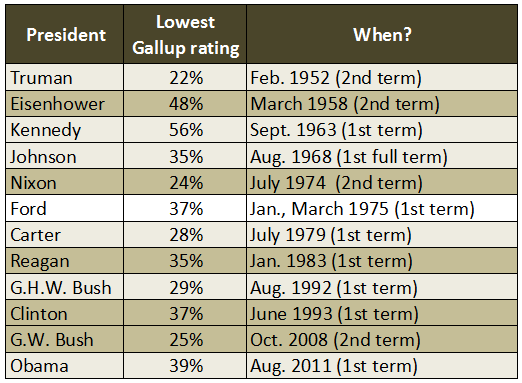 Harry Truman, the first POTUS for whom we have Gallup data throughout his entire tenure in office, was in the 30s at many points in his presidency. He first landed in the 30s during September to December 1946 (33-35%), as the Democrats lost Congress for the first time since FDR’s reign started. He hit 36% in a poll taken in April 1948 and was at 40% at the end of June in the last Gallup “job approval” poll taken before the election. But, to the surprise of the pollsters, “Give ’em Hell” Harry was reelected in 1948. Upset aside, Truman’s trials had just begun. After middling approval throughout the first half of his second term, Truman never saw 40% again after November 1950 — more than two years before he left the White House. He finished his nearly eight years in office at 32% in January 1953. Truman’s near-great status in the history books reminds us that transient public opinion isn’t the alpha and omega of the presidency. Then America began an unusual period of popular presidencies that lasted a dozen years, covering all of Dwight Eisenhower and John F. Kennedy, and the first two years of Lyndon Johnson. Neither Eisenhower nor Kennedy ever fell below 48% in job approval; Ike left the Oval Office at 59% and JFK was at 58% when he was assassinated in November 1963. The golden age for presidents ended abruptly three years later. LBJ began the modern string of presidential 30s. For scattered months in 1967 and 1968, Vietnam brought Johnson low. He bottomed out at 35% in August 1968. Vietnam was as much a worry for Richard Nixon, but he maintained his popularity much better than his predecessor. Nixon never fell below 48% in Gallup until Watergate began taking its full toll in May of 1973, four months into his second term. By July he was under water, below 40% for the remaining 13 months of his presidency. Nixon resigned at 24% approval, close to Truman’s all-time low from 1952 (22%). A sick economy was Gerald Ford’s undoing, far more than his pardon of Richard Nixon, and Ford spent most of the first four months of 1975 in the 30s. Throughout 1976, as the economy gradually picked up, President Ford maintained at least a mid-40s approval level that almost gave him a full term. Ford’s travails were minor compared to Jimmy Carter. High inflation, sky-high interest rates, and the Iranian hostage crisis meant that Carter was in the 20s or 30s for much of his last two years in power. Ronald Reagan spent the lead-up to the 1982 midterm in the low 40s, but in January 1983, at his term’s midpoint, he slipped into the 30s (35%). Economic recovery and then boom times pushed Reagan up and up, until he won a 59% landslide reelection in 1984. By contrast, Reagan’s successor, George H. W. Bush, timed his unpopularity poorly. He had been in solid shape until his reelection year, but not once in 1992 did Bush even touch 50%. The last Gallup job approval survey taken before the 1992 election, in mid-October, had him at a weak 34%. Bill Clinton’s timing was much better. While he had a long string of months in the low-to-mid-40s, he recorded 30-something ratings in only June 1993 and September 1994, and he never slipped below 37%. Because of 9/11 as much as anything else, George W. Bush had the most bipolar presidency since the dawn of presidential polling. In his first term, he spent a mere four months below 50%, never lower than 46%. Incredibly, discounting a tiny honeymoon in his second inaugural month of January 2005, Bush was never above 50% for the entirety of the second term. Bush also dipped into the 20-percentile several times, and after May 2007 he never got above 37% approval. The current White House certainly wouldn’t claim that President Obama is riding a crest of popularity just now. And there’s no guarantee that his wave will ever return. Nonetheless, it’s worth noting that three predecessors — Truman, Reagan, and Clinton — were reelected after having suffered the dirty 30s in the first term. Three others were not reelected — Ford, Carter, and Bush 41 (and arguably LBJ as well, though he withdrew before facing the voters in 1968). Thus, there are precedents to be cited for and against Obama’s reelection. The only thing we’re sure of is that Republicans and Democrats will choose a different set. Joe Figueroa and Tim Robinson contributed to this article. Note: Presidents shaded in light tan only elected to one full term. Presidents shaded in darker tan elected to two full terms. Ford — not shaded — was never elected to a full term.